Thank you for visiting our site. If you have any questions not answered here send us an email. The Odyssey of the Mind team described on this site is the Balsa Build “Structure” team sponsored by the Acton Elementary School in Acton, Maine USA. This is the third year most of the team members have competed in Odyssey of the Mind’s Problem 4 category, the “Structure” problem although some team members have participated in OM for as many as 4 years. So what did the team have to overcome before getting to the point they are now? The problems in the Structure category involve building a structure out of balsa wood. The structure must weigh no more than 15 grams. During the competition the structure is tested to its breaking point by placing weights on top of it until it breaks. Points are given based on how much weight the structure holds, but the team must also create other components of their presentation based on the requirements of the problem. Points are earned for Creativity, Style (Artistic Presentation), Weight held and other objectives specific to the year’s problem. In the months before competition the team typically must create a skit, create and decorate props and produce a performance as part of the long term problem solution. No adult, non-team member or outside help of any kind is permitted. Performances must not be no longer than 8 minutes to cover all of the objectives specified in the problem description. Teams are awarded points based on how well they met the objectives of the problem. Points are deducted for going over the 8 minute time limit and for various violations specified in the problems. There’s a money limit too. No team may spend more money on supplies for their solutions than allowed in the problem category. Usually the limit is about $145.00. All costs and any outside help must be documented. The balsa team started working on their solution in September 2017. On competition day in addition to presenting the team’s long term problem solution, teams must also participate in a Spontaneous (short-term) exercise where they are challenged to a problem that they know nothing about in advance. The team must quickly create a solution to the problem, solve the challenge and complete the objective within the specified time. These problems can be verbal only, hands on, or a combination. The team does not know until they arrive what kind of problem they will face and will be judged on how well they solve the problem with points added by choosing certain paths to achieve the goal. For example, the team may be given a number of items from which to create a tool to retrieve item(s) from across a line beyond which no body parts are allowed to extend. The team may be awarded extra points for each item they were given but did not use as well as any points earned by successfully receiving the item(s). To participate in the State and World competition the team first needed to place third or better in the Regional tournament. Last year many of the same team members competed in the 2017 Structure problem and while they did well in the Regional competition they did not do well enough to earn a position in the State competition. After initially deciding they “never wanted to do this problem again” the team rethought their options and opted to build upon the experiences learned in 2017 and compete once again in the 2018 structure problem. They also learned they needed to practice more in the Short Term/Spontaneous problems to become familiar with how to solve those problems quickly and efficiently. 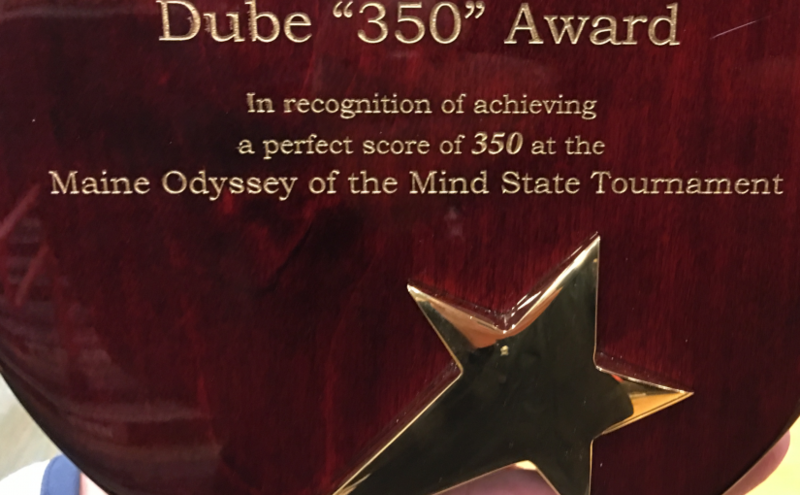 In 2018 the team won first place in the State Tournament as well as the Dube Award for achieving perfect scores in all four judged categories. 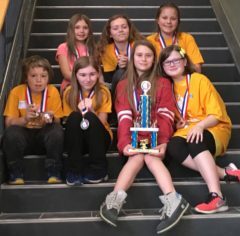 The team won first place in the 2019 Regional competition held at Biddeford High School on April refined and repaired their props and practiced the reworked skit and Spontaneous problems several times a week to prepare for the State Tournament. The commitment and work ethic of the team members paid off!